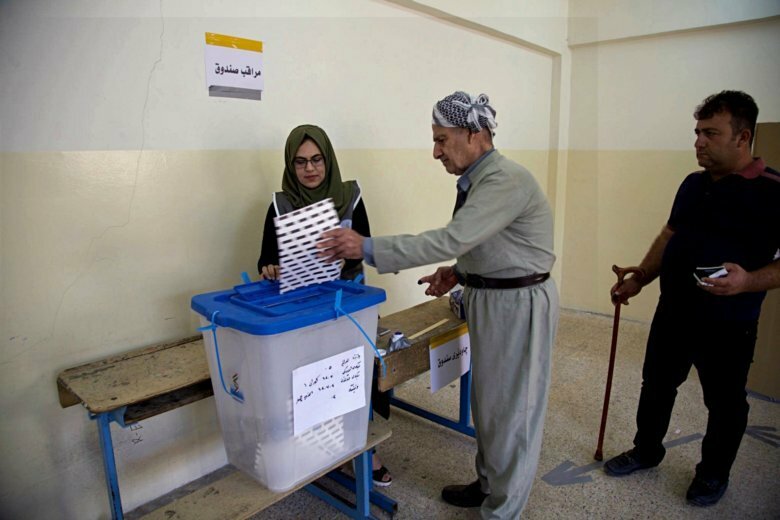 ERBIL, Iraq (AP) — The Iraqi Kurdish party behind last year’s ill-fated independence referendum has won the most seats in parliamentary elections held in the autonomous Kurdish region, authorities said Sunday. The elections commission says the Kurdistan Democratic Party won 45 seats, 12 short of an outright majority in the 111-seat body. Kurdish voters endorsed independence in a referendum last year that was marked by low turnout. Iraq’s central government refused to accept the results, and responded by seizing control of the mixed, multi-ethnic oil-city of Kirkuk and other territories. The elections commission announced the results of the September 30 vote on Sunday. The Patriotic Union of Kurdistan came in second, with 21 seats. The Gorran party came in third. It accused the PUK and KDP of vote-rigging and fraud. “We believe that over 200,000 IDs were faked for the benefit of the two main political parties,” said Fakir Mohammed, the head of public relations for Gorran. The Kurdish region’s electoral commission was divided over whether to ratify the results. Four commissioners — two from Gorran, one from the party Komal and one from the Kurdistan Islamic Union — said they voted against endorsing the outcome, alleging ballot box tampering and the use of intimidation tactics against observers on polling day. They said they did not accept the results, in a statement carried in the semi-official media outlet Rudaw. But the commission proceeded to ratify the vote, with the other five commissioners, each from the KDP and PUK, voting in favor. Mohammed said Gorran was considering whether to boycott parliament. The party lost half its seats in the body, to hold just 12. Mohammed added that his party was weakened by the passing of its charismatic founder, Nawshirwan Mustafa. He died in May 2017.